Business conferences don’t always make guests feel excited and enthralled, but there’s no reason why your next corporate event shouldn’t do just that. Try these creative event lighting tricks to help introduce a bit of ambience and atmosphere to your event, while still keeping an air of professionalism. One of the most common complaints of business conferences and events is how long they can stretch on for. Often spanning several days, it can be extremely hard for guests to stay alert and focused on the topic at hand for hours at a time without breaks. That’s why many organisers and event planners recommend keeping topics and speakers to short, snappy segments, with plenty of breaks in between for the audience to chat, get a drink, stretch their legs and get their brain into gear for the next discussion. A fantastic and effective way to do this is by using lighting as a cue to let the audience know what’s coming up. Install uplights around the room and hand out a guide on what different lighting colours mean. For instance, a pink light flashed at the end of a discussion may indicate that it’s time for a five-minute break, whereas a blue light during a presentation could suggest it’s question time. Not only will this be a fun and interactive way to help guests break up the day, but it may actually help keep their attention, too. Use lighting to let your company’s logo dance all over the walls at your conference. A personalised monogram can project your business branding on the walls, ceilings or floor of your conference venue, in a variety of colours. 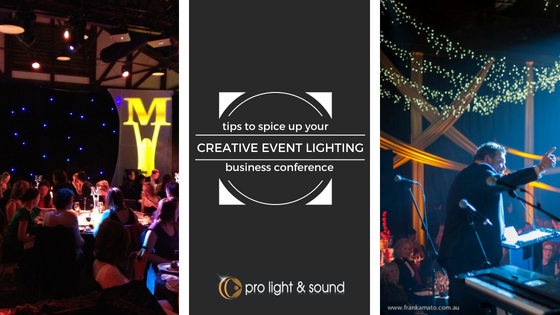 If you don’t want to promote your business at the event, consider utilising the motto or overriding theme of the event and turning it into a creative lighting display. If you are looking for an AV Supplier that thinks outside of the box to help make your next business conference enjoyable as well as informative, speak to a Pro Light & Sound expert today!